The novels of Orhan Pamuk are now piled high in the windows of Istanbul bookshops. His smiling face beams from the front page of every newspaper. "Our Pride," is the headline in Radikal. "Thank you Orhan!" blazes BirGun. "It's very important, I congratulate him," says bookseller Mehmet, who moved all his Pamuk stock to the front of the store as soon as he heard that the first ever Turk had won the Nobel Prize for Literature. "It's not only Orhan Pamuk who's won here. This prize will be a chance for all the world to get to know Turkish literature." Even before the Nobel announcement, Orhan Pamuk was Turkey's best-selling novelist by far. Each of his books had sold more than 115,000 copies here at home. He has been translated into dozens of foreign languages - and demand is now soaring. In the first four hours after the news from Sweden, Pamuk's publishers in Istanbul received another 6,000 orders. They have had to allocate extra printing presses to keep up. But Orhan Pamuk is a difficult hero for some in Turkey. Earlier this year nationalist groups labelled the author a traitor when he spoke out on two of Turkey's most sensitive issues - claims that Ottoman Turks committed genocide against the Armenians nine decades ago, and the plight of ethnic Kurds in modern-day Turkey. His comments earned him death threats - and criminal charges. Pamuk was put on trial for insulting Turkishness, sparking a wave of pressure from the EU which accused Turkey of limiting free speech. "For his words, or his pen?" demands the headline in Vatan newspaper. Inside a columnist argues that the Nobel Prize decision is part of a dark Western plot against Turkey. "I'm not proud Pamuk won. This is all political," Gokhan protests outside another Istanbul bookshop sporting a brand-new window display devoted to the writer. "He didn't get this award for his literature, they gave it to make a point to us here in Turkey." "The nationalists will see Pamuk's win as their loss. It's as if they let in a goal in a football match," Ragip Zarokolu explains. The dissident publisher is on trial himself here for publishing books on the fate of the Ottoman Armenians. He believes Pamuk fully deserves his Nobel Prize, for his literature. "But I feel those of us who dare to speak about our history and face our taboos have won a moral victory with this award too," Ragip Zarokolu adds. "It's an award for the right not to be silent, for freedom of expression." Orhan Pamuk himself is abroad at the moment, where he pronounced himself honoured to receive such recognition. But in the narrow cobbled streets close to his Istanbul home his neighbours are divided over the news. "He comes in here sometimes to buy kiwi fruit and chocolate, he always says hello," enthuses Mehmet, shopkeeper at Pamuk's nearest grocer's. "Of course we're pleased he's brought a prize to our country," he adds. "But is he really on Turkey's side?" "He wanted fame and he's got it," the local florist fumes. "But look at all the muck he's spread with his comments about the Armenians!" Foreign Minister Abdullah Gul said "It is great happiness for us all that a Turkish writer has won such a prestigious award". 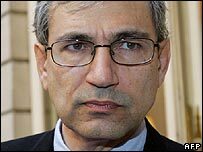 But other Turkish officials did not rush to praise Pamuk - a sign perhaps of how divisive a figure he is here and how sensitive the Armenian issue in particular remains. The prize announcement came on the same day that the French parliament voted to make denial of the Armenian genocide a criminal offence, a decision that infuriated many Turks. But at Iletisim publishing house in Istanbul there is no doubt that their most successful author fully deserves his Nobel Prize for his literary genius alone. "As a novelist he has his own political thoughts, that is natural," believes Bahar Siber, one of a team of editors who works closely with Pamuk. "But this prize is because he invested great efforts for years in the art of novel writing." Iletisim has published Pamuk since 1994. "I think Turkish people should recognize that Orhan Pamuk has achieved a great success and that he is serving the Turkish nation," his editor argues. "He should be a source of pride." For those who agree, there is good news: the editor revealed that Orhan Pamuk's next novel is due out next year. "I'm excited," Bahar Siber admits, explaining that the book will be a new departure for the author - a contemporary love story, to be called Museum of Innocence. "He has not submitted his first draft to us yet, we're expecting the manuscript very soon."